At times all of us experience fear. But don't allow fear to keep you from being used by God. He has kept you thus far; trust Him for the rest of the way. Here lies the tremendous mystery - that God should be all-powerful, yet refuse to coerce. He summons us to cooperation. We are honored in being given the opportunity to participate in his good deeds. Remember how He asked for help in performing his miracles: Fill the waterpots, stretch out your hand, distribute the loaves. Not until we have become humble and teachable, standing in awe of God's holiness and sovereignty...acknowledging our own littleness, distrusting our own thoughts, and willing to have our minds turned upside down, can divine wisdom become ours. The longer you delay, the more your sin gets strength and rooting. If you cannot bend a twig, how will you be able to bend it when it is a tree? Whence comes this idea that if what we are doing is fun, it can't be God's will? The God who made giraffes, a baby's fingernails, a puppy's tail, a crooknecked squash, the bobwhite's call, and a young girl's giggle, has a sense of humor. Make no mistake about that. 'Twas an unhappy Division that has been made between Faith and Works; though in my Intellect I may divide them, just as in the Candle I know there is both Light and Heat. But yet, put out the Candle, and they are both gone. 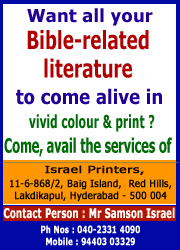 Oh God did not write a book and send it by messenger to be read at a distance by unaided minds. He spoke a Book and lives in His spoken words, constantly speaking His words and causing the power of them to persist across the years. Pardon comes not to the soul alone; or rather, Christ comes not to the soul with pardon only! It is that which He opens the door and enters by, but He comes with a Spirit of life and power. Sometimes God has to put us flat on our back before we are looking up to Him. I do not know anyone who goes through life without some wounding of the heart. Sometimes we take a little shower at Calvary rather than let God deeply cut and wash away the hurts with His atoning blood. It is comforting to know that the God who guides us sees tomorrow more clearly than we see yesterday. God does not give us everything we want, but He does fulfill all His promises . . . leading us along the best and straightest paths to Himself. If I didn't have spiritual faith, I would be a pessimist. But I'm an optimist. I've read the last page in the Bible. It's all going to turn out all right. Satan watches for those vessels that sail without convoy. I only know this, that if He had not sought me out, I would never have come to Him.The church exists by mission, as fire exists by burning. The vine dresser is never nearer the vine than when He is pruning it. Jesus, like any good fisherman, first catches the fish; then He cleans them. Christ is with those of humble mind, not with those who exalt themselves over his flock.